You’ve probably tried snowshoeing a few times, getting out in the North Lake Tahoe scenery, trekking across historic, snow-covered terrain, but have you ever tried taking your snowshoes to a sprint? 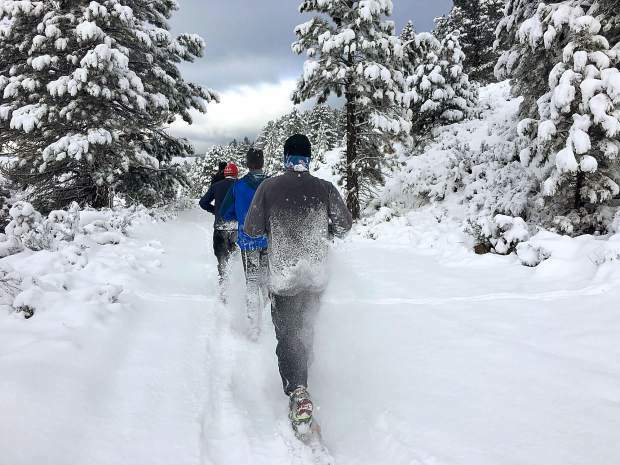 Local athletic running enthusiast group, Donner Party Mountain Runners, doesn’t let a little weather get in the way of their passion for running; rather, they embrace the snow and use it to their advantage. “Who doesn’t love playing in the snow? For me, snowshoe running feels like being a kid, running freely through the winter wonderland. I usually prefer to slide on snow, but when the conditions aren’t just right for skate skiing, I turn to my snowshoes,” said Helen Pelster, board secretary for the Donner Party Mountain Runners. Using snowshoes specifically designed for running with their regular trail running shoes, the Donner Party Mountain Runners take to the snowpack. For comfort, they suggest wearing light waterproof layers as they report getting wet and warm from the activity. “The learning curve for snowshoe running is about 20 steps. Anyone can do it! It is challenging, but can be made much easier by picking more packed trails or simply walking when the effort level gets too high,” Pelster said. Good news — all it takes to get into snowshoe running is the drive to give it a go. Snowshoe running can be done anywhere someone might normally trail run and, in certain conditions, in areas that don’t even have trails. 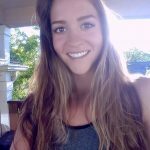 Hillary MacLean is a Donner Party Mountain Runner, who says snowshoe running was another wonderful athletic outlet for her during the winter. “This (last) winter, when I was going crazy because I couldn’t run anywhere but the Legacy Trail, I saw that DPMR was doing a snowshoe run with Alpenglow,” MacLean said. After reaching out to the group on social media MacLean said she received an immediate response from Pelster to take her out for some snowshoe running. “Helen took me out within a couple days. I really feel like she went above and beyond for some random DPMR member that hadn’t participated in any events yet and didn’t know anyone in town beyond her neighbors. It meant a lot to me and I’ve met so many other DPMR members since that have the same awesome qualities,” she said. Pelster suggests for people looking to get a gentle introduction to snowshoe running purchase a trail pass from the local Nordic centers — they allow snowshoe running and the environment is a good way for people to familiarize themselves in a non-intimidating environment. If anyone is looking to snowshoe run in a group, the Donner Party Mountain Runners welcome new running enthusiasts with open arms. “Donner Party Mountain Runners welcome all levels to the group runs. There are four, free snowshoe runs scheduled on Sundays this winter, depending on conditions,” Pelster said.